Seller Financing Available with $225,000 Down. This almost 20 acres of Nature’s beauty features a small, popular campground in Jonesville – close to modern conveniences and highways yet private and secluded. Lots of opportunity and expansion options for the right investor. The current 58 campsites include cabins; electric/water RV spaces as well as electric and primitive tent camping. Buildings, playground and lawn equipment, modern bathhouse and privies included. Where City Meets Blue Grass and 2.2M People within 10 Miles! This park sits on 54 Acres with nearly ¾ mile of River Frontage bosting a 30' boat ramp – it’s one of the best (easiest and most accessible) ramps on this side of the river and 10 miles from an urban population of 2.12 Million people!! This property was developed in the 1920s and became known for its amateur ballfields and even housed a small airport and amusement park when admission was a mere 10 cents! The facility offered River swimming, a concession stand, a swimming pool, boat docks, and a Ferris Wheel. In 1940 a second pool was added, a 2-story grandstand, horseshoe and tennis courts and summer cottages. The 1960s attracted some notable baseball players and a semi-professional baseball beer league played on Sunday afternoons. Sadly, a fire in the late 1960s took most of the park and its structures. These owners purchased the property in 1988 and they went to work! The Marina, boat harbor, campground, rental cottages, and the restaurant was a huge attraction and destination! Now facing serious medical issues these owners made the tough decision to close the restaurant and marina and focus on the campground and cottage rentals. The permits for the Marina are current and this can be re-opened. With its hilly topography, an abundance of water, and miles of green space, this County is the place to be for the outdoor enthusiast and adventurer. Just a quick 10 miles from an urban population of 2.12 Million People! These owners do not have a website or Facebook page. There is no advertising being done. Imagine the potential! 46 site RV Park, 21 full hook up sites, 17 water/electric sites all have 30/50 amp, 4 tent sites with electric 4 tent sites no utilities. Just under 6 acres large shower/bath house with game room, office and laundry. Red Cedar State Bike Trail just across the Red Cedar River. Canoe, Kayak and tube rentals as well. Good small business income open May 1 thru October. 11 Beautiful Acres & Big Rig Friendly! A few things you will notice about this state; the roads are beautiful and free of potholes, the speed limit it a whopping 80 mph and the interstate is littered with signs directing you to lots of attractions! The park is located in a quiet country setting with lots of mature shade trees and just 2 blocks off a heavily traveled east / west interstate. Even though it’s close to the interstate, there is very little road noise and its location is perfect for the overnight traveler. There’s plenty of space for the kids to explore and run, a cute little miniature golf course and a pool for a refreshing dip. Very clean and well-kept with raving reviews! Ready to Enjoy Life On the Lake? Included in the sale: 1 – 24' pontoon, 4– 14' aluminum boats with motors, oars, boat cushions and life jackets and 3 docks with 26 sections. Located half way between two Great Lakes in an ORV and ATV friendly community! This park is conveniently located just a short four miles off a north/south interstate. The area offers so much to the outdoor enthusiast with its unique and popular chain of lakes and rivers. From the world’s toughest boat race held every year to wildlife viewing, snowmobiling, river rafting, boating, fishing and so much more! This family fun park is sure to please! Turn-key, immaculate, move in ready! These owners have one big story to tell! After re-acquiring the property, they went from 12 seasonal guests and no operating cash (foreclosed buyer took all the reservation money and left town) to nearly 30 seasonals and turned a profit in just 2 years! This was one big family that pulled together, rolled up their sleeves and dedicated a lot of time and hard work for their 76-year-old mother, who owned the park. Ready to continue the legacy? We enjoyed the park very friendly people. The kids loved the playgrounds and lake. The showers are hot the sites are large and shaded. We’re here on our first night of two and I absolutely love it! Fun events for the family! Movie’s at dusk and more Labor Day fun! Nice clean bathrooms! I can’t say enough good things about this campsite! Will definitely be back many more times! First-year staying at a campground for the season. Love it here, friendly and nice place. The bathrooms and the grounds are well kept. The owners are friendly and we will definitely be back next year. Thanks for a great camping season! My family just stayed here last night. We loved it! Site 65 is nice and private and shady. The lake wasn’t far either. We all had a blast playing at both playgrounds and on the beach. The kids didn’t want to get out of the water! We will absolutely be coming back. Thanks for the great time guys! Such a sweet little patch of Heaven you have! We had the most fun ever with you all this past Memorial Day weekend. Thank you SO much for your gracious hospitality. Great location and wonderful friendly staff! Super helpful and the facilities were great! We were there with a large group. Great facility, friendly staff, pleasant campsites with a beach to boot! Newly added upgrades include converting all electric sites to 110/50/30 (currently 110/30amps), a new playground was completed in 2017, all new signage, upgraded roads, adding new sand to the beach area, new buoy’s at the swim area. Coming to theatres this fall is a movie that was filmed at this campground and the campers are in the film as extras! How cool is that! We also love to chat, so call us @ 616-532-4835 anytime Monday – Friday, 9 a.m. – 5 p.m., and let’s plan your campground ownership adventure together. This owner is 80 years old and ready to retire but don’t let the age fool you because they are driven to provide great customer experiences and the reviews show it! This may be a small-town mom and pop establishment, however, it is scrupulously clean and has everything a guest would need! It’s not fancy, so don’t expect to see décor by chain designers. What you will see is painted cinderblock, not cheap drywall, spotlessly clean rooms, fast WIFI, large flat screen HDTVs with digital cable and some of the nicest proprietors in the state! 4 Million People in a 50 Mile Radius! Walk right into the awesome growth this park is experiencing! A healthy 10% growth per year with plenty of cash flow to pay yourself and line your pockets for retirement!! Need a secure income all year round? No problem here with its multiple income sources and a 90% seasonal base! This park loaded with family fun! While some of the guests take relaxing seriously, others participate in a wide range of family activities. The draw is the lake, where guests can swim, and fish and the locals can purchase passes to come for a day of swimming. The warmth of these owner’s welcome and the ease with which they make every guest feel at home is what makes this park one of the best in the area! Open May 1 to October 15. 7 Years New / Award Winning, Top Rated Park! With planned activities and lots of amenities, this park is the destination in a huge destination area! Nestled among the highest mountains in the Ozarks, this amazing valley continues to charm travelers with its beauty, quaint shops, delicious eateries, and endless outdoor recreation! The Valley is truly an untapped natural resource and this RV park is positioned as a great headquarters or jumping-off point for family fun vacations. So much to do from natural water slides and canyon-like forges, to civil war reenactments and mountain music festivals, it’s the outdoor recreation capital of the state! Construction began in 2008 with a limited opening in 2009, this park is well positioned to grow with the area! 22 of its acres are prime for expansion and the area is ready! Future pond in the plans! It’s clean, well planned, and waiting for you! This family orientated park provides impeccable customer serviced which is why they have bragging rights on their 86% repeat clientele! Guests love the quiet and solitude that is so hard to find in today’s busy, crowded life! This place is a slice of heaven! Great owners who care about the park and their guests! Very family friendly. Very clean and well kept. This is our families 3rd time staying and we have loved every time! The couple who owns it are not only some of the nicest people we’ve met, but they’ve made a clean, safe, quiet place filled with amenities that make your stay great! The store offers so much you honestly don’t ever have to leave camp! Great RV park. We had a great stay there. Everything is super clean and well maintained. We will be going back for sure. The owners were very friendly and helpful. You will not be disappointed with anything if you stay here. Let The Adventure Begin with Direct ATV Access! Nearly 10,000 motorcycles of all sizes and shapes make their way to this city for the annual Blessing of the Bikes. This ever-popular, family-friendly event brings in thousands of motorcycle enthusiasts to celebrate the joy of two-wheel travel. Where else can you have a National Forest and a State Forest in your backyard! It’s an ATV and ORV rider’s paradise with four designated trails and guests love the ability to ride out from the campground! You think some guests come looking for something a bit more adventurous? This campground is no stranger to summer fun with over a dozen lakes within a five-mile radius! Hiking, biking, canoeing and a little white-water kayaking are favorites for the summer campers. Autumn is a magical time of year with arches of orange, red and yellow painting the landscape so perfectly that outdoor enthusiasts love to come and relax while soaking up the beautiful backdrop. Let us be the first to welcome you! Whether you are ready to make your move, still thinking about it, or already have your suitcases packed, it important to know the small details, so give us call and we’ll be more than happy to share! This well-established campground has been a stopping place for summer campers, tenters, and migrating snow-birds since the ‘70s. We have owned it for the last 19 years and several people have been stopping here since before we purchased it. Located just off the popular Rt 66 byway and near two major interstate intersections in southwest Missouri with easy travel to several major attractions. Travel by car for the day and return to a quiet park with fire pits and picnic tables available at most of the sites. Finish out the day sitting by the pond or in the gazebo. Several buildings on the property could be utilized for other additional income. The park has income from camping, one park model to rent out as well as propane sales. Propane sales are not just campers or an exchange program but a stand-alone dispensing station where you fill tanks or motor homes brought in by local residents. These include BBQ grill tanks, campers, festival operators and local residents that use propane as a supplemental heat source. Propane business supplies an additional year-round revenue and cash stream. Currently utilizing 3 of the 5+ acres there is room for expansion, a custom home site or a myriad of other potential ideas. Owner lives in a park model on premises. This business is a diamond in the rough with lots of opportunity in need of a visionary. The office building that was formerly a convenience store and still has the 5 door walk-in cooler intact (opportunity). Further campground expansion is possible. Propane heat in each of the four primary buildings. This is a great opportunity for someone looking to grow an established business, supplement an income and be their own boss. Visits to the campground are by appointment only and arranged in advance. A complete Confidentiality/Non-Disclosure Agreement will be required prior to the visit. Call 479-257-3760 M-S 9 AM to 5 PM and if no answer please leave a message and we will get back with you. The area is all about outdoor adventure with a State Park, a State Forest, a National Forest and a nearly 11,000-acre Lake, sure to satisfy everyone from the canoe enthusiasts to the avid boater! All of this and nestled in a scenic setting of forests and hills, truly a Midwestern treasure. These owners are in their thirty-something year of campground ownership and while they can write the book, they decided it’s time to pass this wonderful campground to the next owner. Open April 1 to October 31 with plenty of rest in between to rejuvenate. Just a short 5-minute drive to the area’s largest and most visited State Park and the town, which may be small, but people from all over the country come to experience its laid-back beauty and culture. First Class Through and Through! A perfect blend of town and country, home to a bustling university and a friendly community that’s close to both forests and farms all wrapped up in beautiful rolling hills and dense tree canopies! The area is a dream for outdoorsy travelers with plenty of lakes, trails, and forests to keep them busy for days! It’ll be so easy to call this place home. Conveniently located within a day’s drive of over half of the U.S. population, making it a convenient place to stop overnight, for a weekend or a week! Three major roads provide easy access for visitors, no matter where they are coming from! Guests to this park can access the areas massive lake by hiking the parks trail a half mile or simply hop in the car and drive the 1.6 miles to the marina and boat launch. There’s plenty of space on this lake for swimming, water skiing, fast boating, and quiet fishing. This lake is surrounded by several thousands of acres of state and federally owned forest lands. Seller Financing with $50,000 Down, FIRM! Surrounded by beautiful wheat fields and known for agriculture, excellent schools, medical facilities, outdoor recreation and quality of life! It’s a pleasant town, a great place to live and raise the kids! A well-kept, no-frills park conveniently located in a quaint rural city. This park caters to workers who come to the area for oil, gas, pipeline, transmission line, and wind farm projects. While the projects have declined over the last year, there have been permits for two separate pipeline projects and are slated for August and September 2019. 269 RV Sites with 52 Acres! Gross in excess of $500k! 350 Acres and River Frontage! Walk with me through 350 acres of a green and lush, tree-dotted countryside, where 110 acres are developed as a thriving and bustling campground and resort business. (That leaves over 200 acres of un-evolved development potential!) The property is mostly flat ground, with rolling hills and ancient bluffs bordering it on one side, while a sparkling river flows freely along its edge for over a mile on another. Families and groups of friends have been coming to enjoy the many on-site recreational activities at this well-known destination location for over five decades. But customer traffic has exploded over the past twenty-five years, as the current owner has grown and enhanced the amenities, as well as the fun. The secrets to creating and maintaining this highly profitable business come with the sale price—the owners simply want to retire and pass on their success, so they can travel more, discover new adventures, and enjoy the full fruit of their labor. But never fear, they will be your greatest advocates! PLUS, wait until you see the magnificent main building that greets people on their arrival! Yet, there’s plenty of strategic space utilized for selling food and drink, health and beauty items, camping supplies, souvenirs, and more. This is so much more than a country store, and it’s only the first floor. Following the rustic meets luxury brand of this business, the second floor boasts a banquet/meeting hall that holds up to 200 people, multiple offices, a large retail inventory storage space, as well as one of the condos with an enormous wrap around deck. You have to see it to realize how organized and beautifully it lays out. On the third and top level, you’ll find another large condo, nestled above the tree-line, perfect for people and nature watching, on its own private deck. There’s not enough time or space to list every detail that make this a magnificent and unique resort—gorgeous and a money-maker! Highly motivated, realistic sellers, who are very serious about making the sale a win/win—helping you succeed at this business, while affording them new exploration opportunities. The future you imagined is just a phone call away. This welcoming four-season destination campground combines breathtaking area natural attractions, adds in a rich blend of adventure for the ATV enthusiast, sprinkle it with a little relaxation and you get one of those places people keep coming back to! Currently open April to October with potential to extend into the shoulder season or all year. Outdoor and forest recreation is limitless, yet so close to high tourist cities and quaint small towns. The area is popular for fishing, canoeing and boating in its 83+ lakes and 3 rivers! The annual point to point mountain bike race is held traditionally on the first Saturday in November, this thirty-mile race will have a participation of over 6,500 athletes! The event attracts cyclists from Canada and 36 US States. ORV/ATV’s may be operated on maintained county roads, making this the perfect base camp for the ORV/ATV enthusiasts! Just a quick jaunt to 90 miles of ORV/ATV trails, Cross Country Cycle Trails and ORV Routes. The winter season brings in snowmobilers and cross country skiing. The Campground is tucked into 37 wooded acres and there’s plenty of room to expand on the remaining 22 acres. RV storage, dump station and propane sales add to the overall income of the business. The Family Fun Never Ends! Guests love to cuddle up in this warm family friendly campground! Beautiful, well-manicured grounds nestled in a natural wooded setting, offering guests lake-front and large shaded sites that accommodate rigs of all sizes! The nearly new lodge overlooks the 13-acre lake and offers a camp store, ice cream shop and snack bar. Also included in this building is eight poolside motel rooms. The indoor pool and spa are enjoyed rain or shine! The lake is perfect for swimming, fishing, canoeing, and kayaking. If that’s not enough, guests love to get back to nature in the adjacent National Forest and hike the trails, get onto 356 miles of river water for rafting fun, fish in deep pools and long eddies which are the size of several football fields, or simply head out on 750 miles of quality trails for 2 and 4-wheel vehicles! These owners purchased this campground in desperate need of repair and have completely transformed it into a beautiful and popular family friendly campground. In just six seasons the income went from zero to over $600k and shows a steady 10%-15% increase in income per year. These fellas quit their jobs and purchased a campground which had NO customer base and built it into a well-performing business. Talk about faith! With a desire to slow down and enjoy more time with their spouses, it is with deep regrets that they have chosen to part ways and let the next person continue the journey. There is so much untapped potential to truly bring this beautiful park to the next level. Immaculate, Lake Frontage and 42 Acres! This unique area is blessed with the most unimaginable natural wonders! From its masses of lakes interconnecting each other and National Forests, a million acres of public lands to well over 100 rivers and streams! Fishing and boating are the primary reason for visitors to the area, however, when the land is covered by white gold the ever so popular snowmobilers and cross-country skiers flock to the area. Its four seasons are bustling with activities and this lakefront campground is situated in the very heart of it all! Guests return year after year for both unlimited recreation and complete relaxation. The land borders lakes on the north and the south both having 500' of useable lake frontage. A new boat ramp is slated to be installed in the 2018 season. This park is well managed, immaculate, and has a steady and healthy seasonal base. Lake Frontage - 43 Acres! Hidden among the states untouched wilderness this popular resort is right on the water with a quaint hotel, restaurant, bar, several cabins, campground, a bait and tackle shop and so much more! This is the ideal location for fishermen who want to escape on a fishing trip while still having several everyday luxuries at their disposal. Although not nearly as heavily tourist visited as the state’s western shores, this sunrise side of the state is accessed primarily by a two-lane state highway and has the anglers bragging about the one that didn’t get away! Twenty lakes in twenty minutes is a phrase often heard in this area with fishing, wildlife viewing, and water sports all popular attractions at the area’s innumerable lakes. The shoreline is largely undeveloped and each summer, hundreds of fishermen families pack up the car, hitch the boat, grab the kids and head to this popular inland lake which covers nearly 9,000 acres! The fishing season never stops here, with ice fishing nearly as popular as the summer season. The Inn is a three-story building housing a 45-seat restaurant on the main level, a 30 seat bar in the lower walkout level, 11 lodge rooms on the second floor, laundry for linens and a storage area. There is also a large walk-up attic. A 15x24 manager’s office connects the owners home with the Inn. The stand-alone 30x80 retail store, located lakeside, sells live bait, tackle, and basic camping supplies. 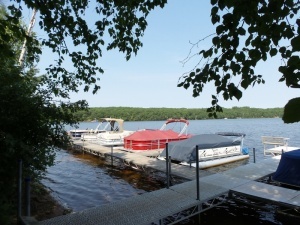 Lund boat and pontoon boat rentals, concrete boat launch and 16 boat slips. This owner took over the operation of this resort in 1995. The resort was run down, so they set out immediately to update the infrastructure, existing buildings, utilities and grounds. Along the way, they were able to purchase more property, construct more buildings and purchase the resort next door to them. These owners had a dream and ambition! After the loss of his wife, his drive has diminished and he is content with business as is. While still making improvements to the infrastructure and adding more buildings all this resort needs is a good business manager for future growth. On its third proprietor in its 75-year history, this resort is known throughout two states and is well positioned for growth in the years ahead. Remarkable Condition and 40 Acres! Natural beauty. It’s the area’s claim to fame. There are no big cities or suburban sprawl in this area of the state. Guests enjoy the miles of sandy shoreline just a quick 10 minutes away, inland lakes, 270 miles of rivers and four-season fisheries, charming, historic towns, and thousands of acres of a National Forest. There are opportunities year-round to explore the county by foot, bicycle, motorcycle and auto, x-country ski, snowshoe, ATV, snowmobile, boat, kayak, and canoe, as roads, trails, rivers, and lakes crisscross throughout the county. This park is super family friendly with lots of adult and kid activities! Looking for a real turnkey business opportunity? Give us a call to schedule a visit! This business also owns a 2-bedroom and a 3-bedroom mobile home. One is provided for the assistant manager and the other is used for family members and friends. Seller Financing with 30% Down. This area has attractions and natural resources for the adventurer, explorer and the curious and this park is positioned perfectly for a weekend stay or extended vacations. It’s a hard-working, fun-loving area! Visitors finding their way to this campground pass by farms growing all kinds of fruits and vegetables, lengthy bicycle trails, and a tributary river for boating, kayaking, and fishing. On an average year, this park boasts 95 seasonal guests making it one great community. As life has it, though, it’s time for this family to move away from the helm and allow you the opportunity to take this park to the next level. There is in excess of 260 thousand people living within a 30-minute drive of this park and some 1.8 million persons living within a 60-minute drive time and represents its core market which means there are probably some 60 thousand RV-owning households within an hour’s drive of this property! Top that off with having four feeder routes with one of them being an Interstate gives this park ready access from all major and secondary metro areas within the described market area. Wow! Campers in this region are generally aware of the area’s pleasant countryside, quiet small-town atmosphere, and recreational opportunities. While this park is out in the country, shopping and services are available within 10 to 30 minutes. Truly a destination unto itself, with its 47 acres of rolling hills, a crystal-clear lake and themed weekends! A sandy beach and lake swimming, river frontage with canoe and kayak rentals offered through a third party, gated entry, great fishing in its 2 ponds, hay rides, game room and lots of fun and relaxing make this a popular family destination! The property is well kept and attractive for its age and market niche. The steady historic occupancy rates with the amenities serve the clientele nicely. From primitive to full service, there are plenty of sites to suit every traveler’s needs! Just a quick half mile off the Interstate with easy pull through RV sites and in the middle of 4 large metropolitan areas, north, south, east and west! Avid campers know that the best way to experience the great outdoors is to camp. Snowbirds moving north and south, know that the best way to get to their destination is to camp at convenient, easy on / easy off interstate campgrounds and locals know that the best way to escape the rat race for a quick weekend getaway is to camp. This park caters to them all! These owners have it all under control with this so easy to operate, well planned park. The camp store / owners apartment is located with easy view of the park. Water, Sun, and Family Fun! Everyone has their own idea of the “perfect” campground. You all want the perfect place. Big lake, little lake? Close to town or not? And everyone’s wants are different. But, rest assured that want list will have all the boxes checked when you see this place! Its located in a great place to vacation where guests come for big family fun on the lake and where you can enjoy a laid-back way of life. It is a vacation paradise offering year-round activities and when summer is in full swing and the sun is shining, nothing calls like the water, but summer isn’t the only time guests visit this park. Fall is a very magical time of year with the amazing colors, they say its some of the best hunting the state has to offer and winter brings in the snowmobilers and cross-country skiers. The best part is that ATVers can ride right from their campsite and hit hundreds of miles of well-marked and groomed trails! The property is surrounded by State and National Forests and 2,200 acres of spring-fed waters to explore. Jump on the Yellow Brick Road to visit this park that has everything you’ve been looking for! Small town charm mixes so easily with big city attractions and this park lies within one hour of half a million people in a large metropolitan area! The possibilities for guests to have a good time are endless. This property offers walking trails, outdoor stage with summer concerts, pond fishing, mini golf, pool swimming, horseshoes, volleyball, playground, pickleball court, and a sports field. This park beckons guests away from the hustle and bustle of everyday life and prompts them to unplug. It’s the kind of park that continues to call you back for frequent visits. If you love people and are looking for something exciting to do with the rest of your life, give us a call to schedule a visit to this fantastic opportunity. There is an owner’s apartment in the welcome center’s lower level. The welcome center contains a full kitchen, library, dining room, and offices. This could be converted easily into owners home. Seller Financing Available to Qualified Buyer! Located in a bustling town hidden away in the Ozark Mountains and great little area full of fishing and boating and lots of lake fun! The lake is the draw to this popular vacation area and it’s less than a two-minute drive from this park. The Lake which winds down through the valleys, surrounded by the hills and hollows of the Ozark Mountains is nestled in the Branson area and offers much more than just water sports. Branson is one of the hottest tourist towns in the US and this park serves as a recreation base camp for those wanting to take in the area’s abundant entertainment and attractions. 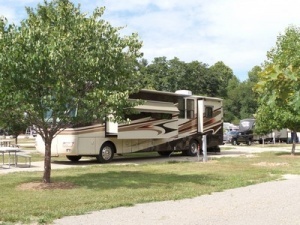 This RV Park offers guests a natural Ozark environment with scenic views, cool breezes, mountain air, comfortable amenities and so much more! Room To Breathe on 115 Acres! Set in the Midwest’s Heartland offering iconic sights and landmarks, beautiful scenery, and plenty of outdoor adventure! Visitors come from all over to explore the underwater cave and fish, float and canoe the two area rivers! With so many miles of the famed Mother Road perfectly preserved here, visitors love to stop into classic wayside towns with tons of charm and quirky shopping plazas with loads of personality! Brand spanking NEW with river frontage and open all year. This owner has gone all out with this park! Projects under construction include a motorcycle / 4-wheeler dirt track in the river bottom, four additional cabins, helicopter landing pad, enclosed recreation center with full kitchen, bathroom and laundry, and an enclosed kitchen and bar under the picnic pavilion. Other planned projects will include 30 additional riverfront RV Sites, zip line, golf cart, and 4-wheeler rentals, horse stall with riding ring and trail rides, swimming pool, and a mini storage building. Over 2 Million Annual Visitors To This Area! Did you know that thousands of tourists travel the historic Route 66 each year? They travel this highway in order to experience an important part of America’s history and this park is the best stop for travelers on the mother road. 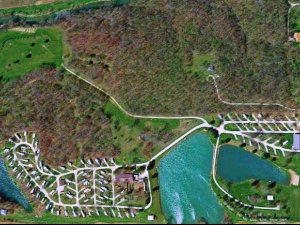 Located off a highly traveled east / west Interstate, there are plenty of towns to visit and things to do, but most guests to this park love to kick back and enjoy its plush 27 acres with lots of mature trees and wildlife, peaceful walking trails, pool, its well-stocked pond, and occasional music shows. When these owners purchased this park, it was very much neglected. But they saw extreme potential to bring this back to its former glory. They have developed friendships with people who come through every fall on their way south and return on their journey north in the spring. From humble beginnings to a solid business, they are proud of what they have accomplished and eager for retirement. Each would have its own water and sewer. There are 3 Homes on the property. A 2/1, 3/1 and a single wide 2/2 that the owners currently use. Two of the homes need to be rehabbed. There is also an old motel building on the property which could be fixed up and used as storage units. This park has plenty of future potential. Nestled in the foothills of the Ozark Mountains this area provides vacation fun for all ages! From incredible scenic panoramas to canoeing and hiking. The town gives visitors a chance to step back in time with an excellent collection of fascinating shops, harvest festivals and lots of outdoor recreation! This is a small family fun rafting and camp park with a strong and loyal customer base. This nature-inspired setting offers a real feel of what camping is all about! Guests are surrounded by nature and the smell of the fresh outdoor air where they can find total relaxation away from the hustle and bustle of the city. There is so much potential to take this to the next level. A River Runs Through It with 54 Acres! With a wide variety of family activities guests to this park create not only some wonderful memories but along the way they find their own stories to tell. Warmth and hospitality still exist at this park where there’s fun for families with kids of all ages. So much to brag about! 71 of the RV Sites are occupied by seasonal guests for a steady income with a waiting list, a graceful flowing river running alongside the entire property, the only grocery and packaged liquor store in the area (which serves the local community too), canoe, tube, and kayak rentals, recently remodeled 3/2 owners home, daily swimming for the locals for $$’s, stunning scenery and breathtaking overlooks on the river, fun, fun, fun family events, and a whopping 54 acres! I’d say this one has it all! A Happy Camper, Immaculate Park! Seller Financing with $80,000 Down! This 4-year new park was built for pipeliners coming to the area and is now reopened as an overnight interstate park. This is a no-frills park, just bring your lawnmower and motorhome. Located within one hour of a large city and in a town defined less by boundaries on a map than by the sense of shared values these people hold so dear. This small town offers a wide range of events, from outdoor concerts, seasonal festivals, and sports competitions, making this city a wonderful place to call home. You can’t build a park from scratch for this price! Missouri River Rec. Area, NWR and Lake Views! My parents purchased this in 1983. It was merely an acre of dirt used as a 23 site campground. They had a vision and saw the need for a motel in this small and scenic community. So, these two visionaries traveled some 120 miles from their acre of dirt and purchased a small motel, with the intent of moving it to their little piece of dirt. That is precisely what they did. They started with the construction of a basement and designed it with one wing to be used as a one room apartment and the second wing to house the utilities and storage areas. They also added a huge room to house bigger groups of guests. Once the basement was completed they set out to move the motel they purchased some 120 miles away to this newly constructed foundation. Today, we would have just built a new motel from the ground up, these visionaries did it the old fashioned way and it provided them with a living for some 28 years. Mom ran the day to day operations of the Motel / Campground while Dad tended to the farm and ranch and showed up at the Motel for the handyman side of the business. Dad succumbed to a rare form of cancer in 2011 and while mom’s health started to deteriorate well before dad’s death, she was now in assisted living. I, being the current owner, along with my wife operated the motel and campground for the remainder of the 2011 season. In November of 2011, the last door was locked and the Motel was closed down. Mom joined dad in 2014 and the settlement of the estate began. I purchased the property in an effort to assist in settling my parent’s estate in August 2015. While it was not my intent to run the business (obligations to another business I own), I felt the need to get it up and running again for mom and dad’s sake and make it saleable. So, off to work I went and in the fall of 2015 we turned the water back on, completed a thorough check of the heating and cooling systems, deep cleaned every room and got it ready for as if condition. I then winterized the entire property and shut it down for the winter. Spring of 2016, I again turned on the water, inspected the heating and cooling systems and deep cleaned every room. A new steel roof and some new doors were installed on the motel. I will return in the fall and winter ready it. Today, this business has nine motel units, one large group room, an office, laundry room and utility room. The campground end of the business has 13 full hook-up RV Sites and 7 Mobile Home Sites and a bathhouse. There are no tax / business records for the last three years, due to its closure for the last 5 years. This motel / campground business stands ready to be opened and operated on a buyers closing day. We have a huge list of ideas for this business. Because of its close proximity (1/2 mile) from the areas lake there’s untapped potential for canoe/kayak/boat rentals and you would be the only rental in the entire area! Advertise to the ATV’er, there’s literally hundreds of miles of shoreline and beaches for ATV journeys or how about fishing tournaments and classic car shows? If that doesn’t suit your fancy, try a fishing and/or hunting guide service. We are looking for the visionary just like mom and dad were. This is your opportunity to build it, and don’t worry, they will come. This naturally scenic area, with its sandy beaches, high bluffs, clean lakes, and natural rivers is the draw for thousands of visitors each year and lifelong residents. They come because of the pace of life, the back to basics in the small towns and villages where parking your car is not a challenge, bank tellers know customers by name and the Fourth of July festivities are right out of a Norman Rockwell painting! These 40-year veteran owners have lovingly cared for this resort and its guests and reflect pride of ownership! This “need nothing” resort is impeccable and turnkey ready! Currently open March to November, however year round ready to cater to those guests that love winter recreation! A Real Gem Tucked In The Heart Of The Nation! Opportunity awaits the buyer of this well-known campground and RV park located in the rolling hills of Eastern Iowa on 12 beautiful acres on Dubuque’s west side. The work has been done in creating 80 campsites. Campers can enjoy the clubhouse with baths and showers, 24 x 48 in-ground pool, game room, large outdoor pavilion, playground, picnic area, and volleyball court. This is a great opportunity to run a profitable business while only being open 6 months per year. Campground, pool, and buildings are in very good condition. The site has its own well, plenty of electrical, and closed septic system with (3) 1,300-gallon tanks. Call Dave Sandman at RE/MAX Realty. 563-599-7444. Family Friendly and Gorgeously Beautiful! While the area offers something for everyone, this park is all wrapped up in Midwest hospitality with planned weekend activities! It’s 57 acres allows for 15 (+/-) acres to expand on. The campground is blanketed with rolling hills, hiking trails through wooded land, and 3 large ponds, for swimming, boating, and fishing. The lodge provides a place to rest and relax while the kids mine for gemstones and fossils or play at the playground. Putt putt golf, rental cabins, a healthy seasonal base, breakfast served on weekends (short order grill) this one has everything you are looking for! This park is a favorite among the Route 66 travelers and snowbirds in flight to and from their winter roost. It caters to overnight interstate traffic and folks that just want to get away to enjoy a quiet country campground within an hour of big city attractions. Guests can visit caves, jump on a zip line, take a day trip to a large amusement park, check out local wineries, or kick back for a lazy day float on the nearby scenic river. Squeaky clean and well designed. Just jump in and take over this extremely organized operation! The cafe is open 3 hours daily and serves BBQ and pizza. So easy! When it comes to location, it’s perfect. The location is less than a quarter mile from the popular Route 66 and a major east/west interstate. Located in the hub of where several great lakes meet which provide more than 100,000 acres of unsurpassed beauty and family fun! This area is truly an outdoor playground because it offers a diversity of outdoor recreation. There are miles of hiking and biking trails, a conservation area with 655 miles of nature viewing, small game hunting, and 25 miles of developed horse trails. The two large lakes offer un-crowded ample fishing, big boats, and big fun! The park is just a quick 5 miles from a public use area which offers guests a boat ramp and marina. Offering 3 income sources for a stable year-round income. 27 of the parks 30 RV sites are occupied by seasonal guests and all sites are full hookup. The mobile home part of the business is separated from the RV park by a large common area that has a 2-acre pond for swimming and fishing. Paddle boats and Kayaks are allowed in the pond. This park is so easy to manage. The current owner spends approximately 8-10 hours a week with management. They keep two RV sites available for overnight/weekend guests. Low maintenance, long-term annual renters, metered electric serviced by the local electric co-op so no meter reading and billing. It doesn’t get any easier than this, folks! Well Maintained & Perfect 2 Person Operation! The area offers a small-town atmosphere with down-home celebrations and festivals and a triple-A school system! Nestled in the Ozark Mountains, this town is truly a treasure with forests, fields, and streams, that provide many outdoor recreational opportunities. Partially surrounded by a National Forest where guests can hike its 23-mile trail weaving through narrow ridge tops above the surrounding rolling countryside. Sportsman gather in the fall to hunt deer, turkey, and small game. Fishing and canoeing are the summers favorite past time and others love the availability of the area’s ATV trails. This business has been a lifestyle for these owners. They have operated it as a couple with some help during their high season. They have a great reputation in the community and your neighbors are ranchers with the Amish and Mennonite communities within 30 miles. Lake Frontage with 20 Acres! Lake frontage with 29 Boat Slips and 20 Acres! This park caters to the seasonal guest with all sites 100% occupied. Room to expand on 10 +/– acres. Known for being the home of nine covered bridges, a University, great music, beautiful nature parks and attractions, including the state’s largest waterfall, equestrian adventures and unique agriculture experiences, including elk, orchids and maple syrup! It’s a wonderful place to live, work and play! Big Creek Resort is on the Big Creek Arm of Bull Shoals Lake in the Ozark Mountains of Theodosia, Mo. It is one of the most beautiful man-made lakes around. Besides having four state records for largest Bass caught in Missouri, this lake also has over 1,000 miles of undisturbed shore line. During the summer the water is a beautiful clear blue with an average temperature of 80 degrees. Bull Shoals Lake is great for swimming, boating, skiing, tubing, scuba diving and of course fishing. 8 Cabins, Various Sizes, ALL with a View of the Lake. Includes Shower House / Laundry, Gift Shop, Pavilion, and Playground. 4 Concrete RV Lots, each with 50/30/20 amps, Water and Sewer. Immaculate Beauty on 60 Acres! Its eight-month season puts you in the warm southern sunshine four months of the year! On the flip side, you’ll get eight months of some of the best scenery around every corner! This area provides guests a hundred reasons to have one great vacation! It’s a people-friendly area with an awesome up-north, small-town appeal. The area is truly a four-season vacation wonderland. You can swim, hike, golf, ski, run ATVs or snowmobiles on groomed trails, canoe, kayak, float, and sail. This is why guests keep on coming back. Be careful, you will fall in love with the quaint communities and the unbelievable warm and welcoming people! A 128-acre equine based campground that sits in the heart of the National Shawnee Forest. The beautiful 50-year-old campground has 200 sites with electricity and water at each site. The front office is a 20 ft. by 30 ft. building with 1080 sq. ft. storage space attached to it. The campground includes 2 bathhouses, event center with a commercial kitchen and a 24 ft. by 40 ft. attached pavilion, a 24 ft. by 30 ft. pavilion, 4 cabins, also a 125 ft. by 250 ft. outdoor lighted arena with roping boxes. We presently have 85 yearly tenants. Fantastic funds generating campground consistently at full capacity is currently available. When you schedule your tour, you may as well pull the camper on in to enjoy the marvelous 10,000 sq ft cabin clubhouse/ reception hall with commercial kitchen, 2 pavilions, a convenient store, the party barn, and bathhouse /laundry facility. If kids are in tow, then the pool, huge playground, paddle-boats, toddlers recreation building, huge video arcade, beach volleyball or putt putt golf course may catch your interest. Boat in or out from the boat dock on Eagle creek with access to the OH River. Yet at days end, this 280 space campground on 54 acres with its attractive income production will please you just as much as spending family time here. I will be pleased to take phone calls only on this opportunity and answer any questions or schedule a personal tour. State Route 52 East from Ripley to Scoffield on the left. Travel Scoffield to Camping resort on the right. This Park has a Unique Tourist Draw! This corner of the state is perhaps the most beautiful, with its rounded bluffs framing a jumble of islands. Two state parks atop the bluffs just south of the campground have miles of hiking and skiing trails. The town itself is tucked away in a little bowl, hugged on three sides by wooded bluffs and there’s no way to get there that’s not relentlessly scenic. Three weekends of craft festivals draw lots of visitors and a new breed of tourist is coming for the hiking, canoeing, and bird-watching at the State Forest. It’s a beautiful part of the state, and definitely not flat. This park is a destination in itself with a very unique tourist draw, but you have to call us to find out what it is! 2 Log Homes are included in the sale. One log home, built in 2005 is used for staff, has 2 bedrooms and 1.5 bathrooms, loft with dormer, living room with cultured stone fireplace, kitchen has hickory cabinets, drive-in basement with 2 car garage, heat, and air. The second log home is the owner’s home, it has 2 stories plus a loft. Amish, custom built-in 2016. The first level of this home features a drive-in double garage, bar with full kitchen, (commercial gas stove/oven), office, utility room, living room,1/2 bath. The second level contains the great room, kitchen, master bedroom and master bath, 2 additional bedrooms, and a bathroom. The third-floor loft has two full-length dormers, living room, bath, and two bedrooms. In the Heart of a Recreational Area! Nature is the backdrop for the many activities this area offers with 110,000 acres of fun! Boating, sailing, kayaking, rafting, swimming, fishing, hunting an about 400 acres of trails, rolling hills and scattered mud pits for the ATV and dirt bike enthusiast! This park was inherited. The parents owned this for nearly 20 years and the family is ready to sell. This property has so much potential! Just 5 minutes from one of the state’s great lakes and a marina. It’s quiet and shaded and ready to be taken to the next level. Over 13.5 Million Annual Visitors to this Area! This destination property is situated 3 miles from town and within 20 minutes of two national monuments, a national park and the # 1 state park in the state. It is located within 2 hours to 6 hours of 4 more national parks. The area boasts 13.7 million visitors annually, and an hour from the worlds largest annual motorcycle rally on a major east/west national highway. The main building contains the camp store, registration area, business office, bathhouse, handicapped/family bathroom, laundry, information, and Internet Lounge on the main floor. Upstairs there is a 3 bedroom apartment complete with two bathrooms, laundry with a two car heated garage. A 32' X 26' shop building that is heated and air-conditioned. Firewood and housekeeping building is across from the main building. Other amenities include two in-ground pools, 365' water slide, playground, pet park, basketball half-court, tetherball and three horseshoe pits. There is a propane filling station, firewood sales, cable tv, and wifi. Most of the +/– 19 acres have mature trees on rolling terrain which provides for a great deal of natural beauty and privacy for our level campsites. two full-service cabins, two partial service cabins. 24' X 36' log and timber Rec Hall, pavilion and 3/2 apartment with two car garage. This is a turn key operating business starting its 41st year. We are happy to talk to you about our park. to set up a time to talk by phone about our park and to set up a time for a tour. Visits to this business are by appointment only, arranged with us. It requires completion of a Non-Disclosure Confidentiality Agreement. Must see! This unique natural gem, located in northwestern Illinois with easy access to Interstates 74, 88 and 80, is brimming with commercial or private recreational opportunities//possibilities! Located on a secluded lake, this property boasts majestic oaks, open spaces, and picturesque views. It is a perfect spot to unwind, enjoy the outdoors or catch spectacular sunsets. Through 2009 it was an active campground – situated on 38+/– acres of trees with frontage on a 40+ acre lake – perfect for fishing, boating, canoeing, paddle boating and kayaking. Bird watchers have a front-row seat for viewing a variety of native birds as well as the migratory populations that traverse the Mississippi and Rock River flyway! Some TLC and new/updated infrastructure would greatly enhance the income potential of this property. It has a long history as a natural recreational area. Most recently it operated as Spirits in the Oaks campground and hosted an annual Native American Pow Wow for many years. With this property, there is also the opportunity to purchase an additional nearly 100 acres of resort-like property that could be used for hiking, camping, fishing, hunting, birding, etc. This optional parcel includes a separate 20+ acre lake, woods, and meadows (fields, pasture), and a large, rustic 2-story barn with a new roof (used as a party barn for several years). It also includes frontage on the Rock River. This property is just 2 hours west of Chicago and about 20 minutes from the Quad Cities, with an array of vibrant communities; entertainment, shopping and dining options; museums and a river center. 38 +/– acres/Lake frontage. Nearly all sites have a view of the lake. 11 campsites are situated on level, grassy areas with electrical meters and water line. Pavilion with social area, camp store, registration, and machine shop. Viewing is by appointment only. The property is being sold “as is” as it is in an estate. The area boasts that you can roam with buffalo, paddle lots of waterways, explore Amish Country, golf 20 courses, and pedal some bike trails. But that’s not what guests to this park do. This park is the destination with so many family activities! This park caters to seasonal and weekenders with its unique water playground with a trolley, swing outs, diving boards, slides, piers, basketball, and volleyball! Day passes for the general public bring in additional income along with the concession stand, pavilion rentals, arcade and a large pavilion with fireplace for weddings. This beautiful, well-maintained camping resort offers guests a unique aesthetically pleasing setting in a quiet and relaxed natural environment, yet it’s conveniently located near village merchants and popular points of interest. With access to a quiet (no gas motors permitted) private 80-acre lake guests bring their boats to fish in depths of 40 – 70 feet. Boasting a sandy, clear water swimming beach, breathtaking sunsets, canoeing and kayaking and wooded trails for hiking. This price gives the new owner access to the private lake only, however, if you want to “own” the lake too, hop on over to File #15775 for pricing. Visitors to the area find so much to see and do that those dreaded words “I’m bored” by so many kids become a thing of the past! This family-friendly area has dozens of great attractions and plenty of exciting places to visit and is truly the travelers best-kept secret! As you begin to count the days until you can visit this beautiful park, you’ll soon realize what you are missing. Gone are the bright lights, big cities and hustle, and bustle of daily life. Welcome to the Heartland of America, where seven roads lead travelers to their destinations, winding alongside great rivers, stretching across grassy plains and fields of grain. Today, these roads are known as America’s Byways. Midway between to large cities and a half mile from an easy on/off interstate, this park is the choice for travelers coming off the road for a quick overnight stay and for folks that want to sit back and catch their breath for a weekend. So much family fun with a catch and release fishing pond, playground, hayrides, swimming, pancake breakfasts and ice cream socials! 1. The pond is not owned by the park. They have a lease for the use from the adjacent landowner. 2. The 56 x 53 equipment building also serves as a garage for RV repairs. They currently have 1 employee that does the RV service and assists with ground maintenance working 40 hours per week. There are no other employees. 3. A 1996 Park Model is utilized as the owner’s quarters in-season. Where else can you work 9 months and have 3 months off? Come on, merge out of the fast lane, grab your map, roll down your windows and plan your visit to this awesome park today! Beautiful Park - Easy Operation! Just a quick 12 miles puts you at the Mississippi River and a town that is very active in the 50 Miles of Art, an event held twice a year where professional artists open their studios, galleries, and retail spaces to showcase works of art that can’t be found anywhere else! Tourism is gaining importance as visitors realize what an interesting place the region is to visit. This area is experiencing tremendous growth as the large metropolitan area to its south, moves north! Its natural beauty attracts visitors with its scenic overlooks and impressive views of the Mississippi River from the tops of the limestone bluffs. This easy to operate park boasts a Woodall’s 5W Rating with a 75% repeat clientele! Excellent schools, churches, and health care facilities are all in place to make this a great place to call home! Lovely small park just out of town with easy in and out. Very well maintained with great service. Long pull thru sites with well-manicured landscaping. Worth an overnight stop. We stayed at this park as it was close to some friends. The park is neat and clean, and the owners are friendly, helpful and very nice. Nice long and fairly level pull-through sites, good 50 amp service. Nice little park. Quiet. Just off the road. Easy in and out. Owners are friendly and proud of their campground. I arrived late and the owner was at the entrance waiting to direct me to my site. Has putt-putt golf. The laundry room was spotless. Small park but great for an overnight. You can tell the owners have a lot of pride in their park. We just stayed in a pull-through and didn’t unhook. Park is very clean and well kept. Has a putt putt course, which was very cute. Nice personnel in the office. Would stay here again. A very nice and well-kept campground. Good long pull throughs with great space between, very clean restrooms. Non-Disclosure / Confidentiality Agreement required prior to viewing the property and providing additional information. The county is bounded on the south by a Great Lake, that boasts some 211 miles of Great Lakes Shoreline! The area is rural enough so there’s no time stuck in traffic yet it’s big enough to have everything you need and most of what you want! A really bad week here is a string of break-ins! Imagine crime rates some 47% below the national average! Dreaming of this type of lifestyle? Guests to this park love to laze away warm summer days on the lakes, visit the many waterfalls, find ship-wrecks, explore lighthouses, Fishing year round for all kinds of trophy fish (five minutes to the bay boat launch), canoeing and kayaking on the scenic rivers, hiking or horseback riding on one of the longest (40 miles) historic trails in the State taking them from one Great Lake to another, hunting the hundreds of acres of public land in the National Forest, mountain biking on the 20-mile trail system and snowmobiling on over 2,500 miles of interconnecting trails. The current owner developed this park around about 1970. At 75 years of age, she is ready to retire. The park is absolutely adorable and well maintained, even though she is running out of energy. She has not raised MH rents in some 11 years. Potential to bring back the propane sales. ALL VIEWINGS BY APPOINTMENT ONLY! SVN l Holman Norden is pleased to present a 100% fee simple interest in Tievoli Hills Resort located at 25795 Hwy N, Clarksville, MO 63336. This 245+/– acre facility has over 140 acres of manicured recreational grounds. Featuring RV Camping, Condos, Cabins, and Tent Camping with a wide variety of entertainment from a swimming pool to the driving range. The Main Lodge provides an elegant banquet facility or retreat location with extensive services available. This property is in excellent condition with many mechanical and aesthetic updates. Currently, the property and grounds are being underutilized. This resort is ready for a vibrant new owner with the vision, desire and ability to take advantage of all the beauty, splendor and potential that is Tievoli Hills Resort. Pool, fishing, driving range, mini golf, baseball field, racquetball, basketball, tennis courts, batting cages, movie theater, volleyball court, game room, bocce ball, horseshoe pits, stables. Updated overhead electric, county water, newer private sewer treatment plants. Two Minutes From One Huge Lake! Located between two federal reservoirs, one lake just a quick 10 minutes and the other a mere 2 minutes from this delightful park! Combine the lakes and guests to this park have some 11,000 acres of water to play in! Both lakes have generally calm waters, several public boat launches and are popular lakes for boating, skiing, swimming, fishing, and sailing! This is a town where small-town charm mixes easily with big-city attractions! Guests come to this park for a relaxing weekend away and others stop in while traveling the state scenic routes. The park is shaded by trees and surrounded by green rolling hills, woods, lakes and farmland with direct access to miles and miles of hiking, biking and horse trails. This Northwoods Resort and Campground offers 13.47 acres with 300+/– feet of frontage and breathtaking sunsets along the shores of famous Lake Chetac, known for its fishing! This resort has 40 sites that rent for $2,000/season, with 5 overnight sites that rent for $28/nite. All sites have full hookups and 50 amp service. Looking to expand? the Seller is approved for 35 additional seasonal sites that will rent for $3,000/season (client list included). There’s a 2 BR mobile home and 5 Lakeside 3 BR, 1 BA seasonal cottages with a base rent of $810/week, and the cottages have a condo plat. There is a substantial dock system w/stairs and elevator/lift to give boaters easy access to the sand volleyball court and bar (seats 50). The bar has a great vibe, has wifi and serves burgers, pizza and the best specialty drinks in the Northwoods! There’s a 6 stall fish cleaning house, a shower house with laundry, and 30x20 metal storage shed. It’s the place to be! This park pulls people in from miles and miles around! Located in an out-of-the-way rural town, a big place in terms of natural beauty, quality of life, and a close knit community. Within an hour’s drive of over 9 million people, this park is so easy to get to with major interstates to its North, South, and West. The location is perfect! The property is sitting on 26 green, glorious and beautiful acres! The best part of this business is that the park itself is the attraction! These sellers didn’t miss a thing! It’s a family fun park through and through! The 7200 square foot main building has it all! Movie theater, camp store, registration area, a snack shop with small eating area, arcade, kiddies craft room, restrooms, studio room, and storage area. The main attraction is the lake with 11 water toys for the kids, and adults too! This place is packed all summer long with campers and area guests who can buy a day pass for use of the lake and the picnic area! This is one amazing park at an amazingly low price! Over 13 Million Visitors Annually To This Area! Located in an area that boasts world-class attractions and phenomenal outdoor opportunities, gathering tourists, filmmakers and writers from all over the world, this big little city is a hot spot! Surrounded by pine forests, meandering trout streams and magnificent mountain meadows this is the States outdoor recreational capital! The park is rated a 4.5 (90 reviews) and a 4 out of 5 based on 1000 reviews! Award-winning for meeting exceptional quality standards and being recognized by their guests for outstanding service. So turnkey and so easy to operate! Step into this long-established business with growing revenues and a steady clientele base. Immaculate & Turn Key Ready! 3 Year Average Gross Income $708,375! Rich in history and natural resources, this corner of the state has been worth the trip for people from all over the world for over 200 years. Perfectly placed at the confluence of two rivers where sportsmen find their catch in year ‘round fishing and golfers experience unparalleled views of the “Big Lake” while they tee off from the overlooking bluffs. Off-roaders can fight their way over big climbs, down steep descents, scrambling for traction, kayakers and canoers have plenty of water with good currents and hunters, photographers and birders can work their way through this vast area of treasures. With big open skies, numerous waterways, abundant wildlife, picturesque rural buildings, and spectacular sunrises and sunsets, you will not be disappointed. You're Window of Opportunity... Just Opened! Seller will consider all offers. Health forces sale. Located 1 mile off an East/West Interstate and right in the middle of 2 major North/South Interstates! This immaculate park has the best of both worlds: overnight campers and seasonal guests. Cash in on this turnkey opportunity with a private lake and pool. Same owner for some 26 years is so tired and has health issues that is forcing the sale. It doesn’t get any better than this. The entire Missouri River features hundreds of miles of prime hunting and fishing with four large lakes and all the biking, hiking, sight-seeing and exploring anyone could ever want. This park is located a short 9 miles from the largest of the four Missouri River reservoirs. Visitors to this park love reeling in a world-class walleye and cruising the lake on a jet ski. Others come for a great weekend getaway and a place to hang their hat. Acreage is level with lots of shade trees and fruit trees. The town has a population of about 1152 people and Gettysburg is the epitome of small-town living sitting so peacefully in the middle of the Prairie. 16 x 80 MH with a 16 x 28 Addition, 2-Covered Patios, and a Deck. Do you enjoy the lake lifestyle? Would you like 3 months off to travel or head south for the Winter? This Resort near Mark Twain Lake in Missouri can be your next adventure. Mark Twain Lake is an 18,600-acre lake in NE Missouri. There are many recreational opportunities at the lake and the Resort is minutes from Clarence Cannon Dam, Behrens Recreation Area, and Blackjack Marina. The owners have run a very good operation with consistent numbers over the years but are now ready to retire. There is over an acre of property that can be used for expansion. It’s now your turn to take this business to the next level. We have identified multiple ways to increase revenue to the Resort. Room to Grow in this Big and Beautiful Park! Pristine dunes, beaches, and spectacular sunsets awe visitors who love to come to this area for four seasons of fun! This park is one special place indeed! Once you arrive for a visit, you’ll understand why folks love it so much that they want to keep it all to themselves! But, the secrets out and this newly built park is being discovered by new guests every year! It’s the perfect place for guests to enjoy all this beach town has to offer from brewpubs, good eats and restored vintage movie theaters to family fun and natural beauty along its National Lakeshore with some of the best scenic autumn drives!